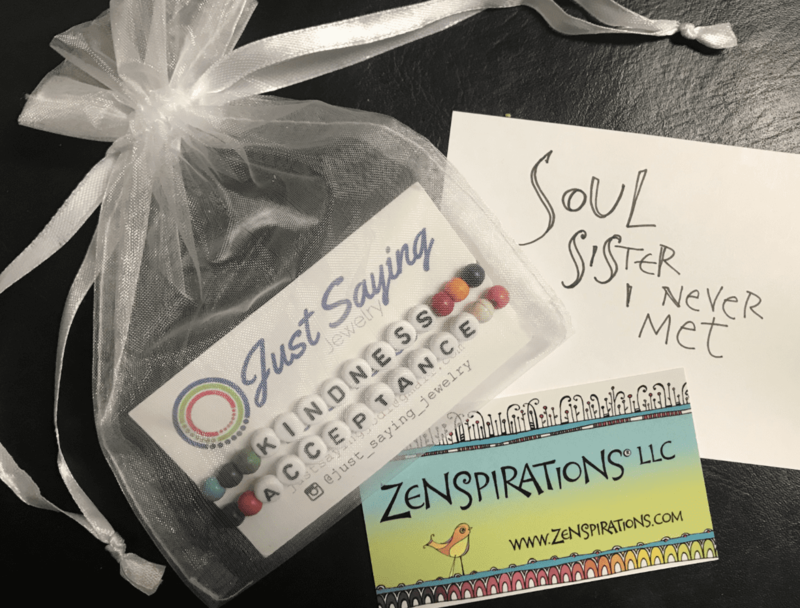 I was touched to receive an unexpected package this week from Jodi Weiss of Just Saying Jewelry, with two beautiful, handmade bracelets featuring the Zenspirations® Community’s words of the year: Kindness & Acceptance! When I called Jodi to thank her, she said something that really resonated with me, “I feel like you are a soul sister I never met!” Not only do I feel that way about Jodi, that’s how I feel about everyone in the Zenspirations® community; we are Soul Sisters who share a commitment to using our creative talents to make a difference in the world. It doesn’t matter whether your talent is culinary, musical, technical or artistic– what matters is intentionally sharing your gifts to bless others. My life has been deeply enriched by the connections I’ve made in this group. You, my ‘Soul Sisters’, hold a special place in my heart, regardless of whether we’ve ever even interacted. You’re my tribe, and I am profoundly grateful for each and every one of you. After getting Jodi’s surprise package, I wanted to see more of her work, and was delighted to discover that she sells the word bracelets for only $10. Here’s a link to Jodi’s @just_saying_jewelry Instagram feed, in case you’d like to order a bracelet with your word of the year. And, while you are there, I invite you to check out– and follow– Zenspirations on Instagram. I’d also recommend checking out my friend Kathy Milici’s Instagram Feed. In addition to being an incredible pointed pen artist, Kathy is an incredible human being, and I consider her a true Soul Sister. I was thrilled to get one of Kathy’s gorgeous “Welcome 2019” envelopes, which has a special place in my office. For those who have my book, Complete Guide to Bible Journaling, you can see another example of Kathy’s lovely pointed pen work on page 107. (If you don’t have the book, I just noticed that Amazon has it on-sale for $9.30, which is less than half of the usual $19.99 price!). For those interested in Bible Journaling, you won’t want to miss all the goodies that my friend Mary Anne Fellows shares on the @BibleJournalingJumpstart Instagram page and you are welcome to join the Bible Journaling Jumpstart Facebook group, where you can ask questions and share your Bible Journaling pages. 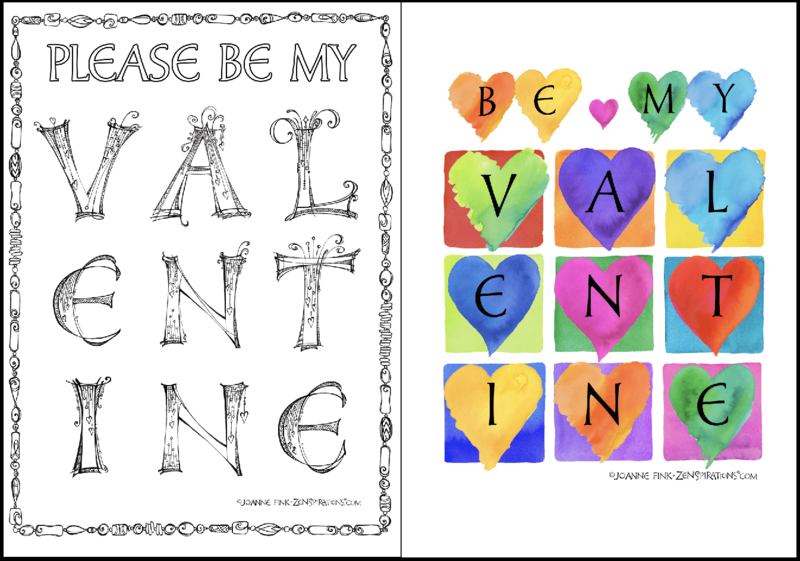 If you subscribe to the Live Zenspired Newsletter, you’ll be getting two free digital downloads; a Dangle Monogram Valentine that you can color, and an already colorful hearts and squares design. Of course you can always head to the ZenspirationsDesigns Etsy Shop and get the components you need to make your own versions of the designs. 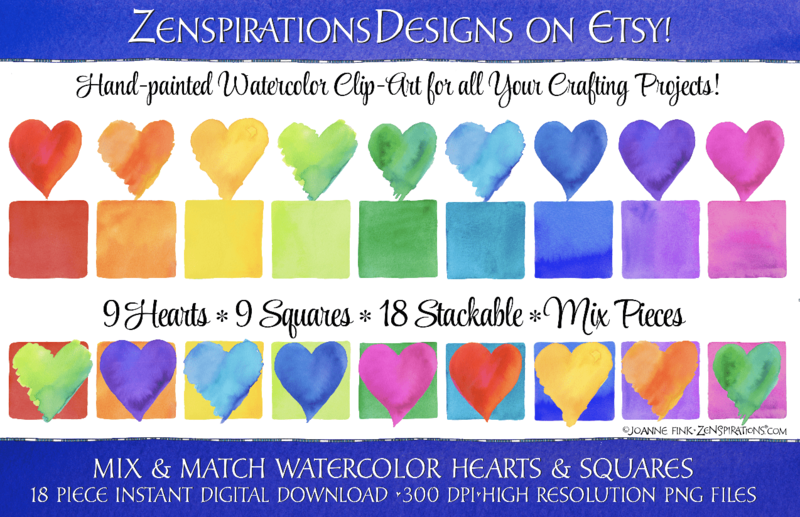 The hand-painted watercolor clip-art hearts and squares collection is only $2.49 for all 18 pieces– and there are SO many different ways to use them! 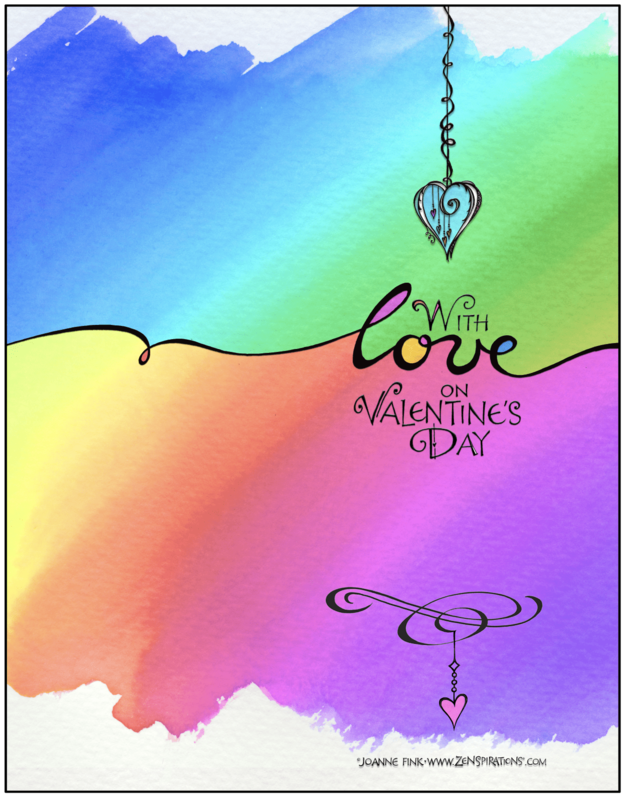 If you are not a subscriber, there are seven free Valentine’s Day downloads in The Color of LOVE blog from 2015, which I invite you to use to share the love! 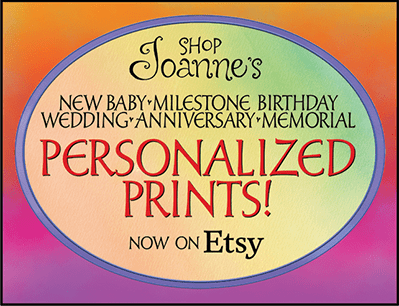 I always enjoy personalizing designs, and encourage you to incorporate a name into your design. I personalized this design by adding a name right above the flourish. 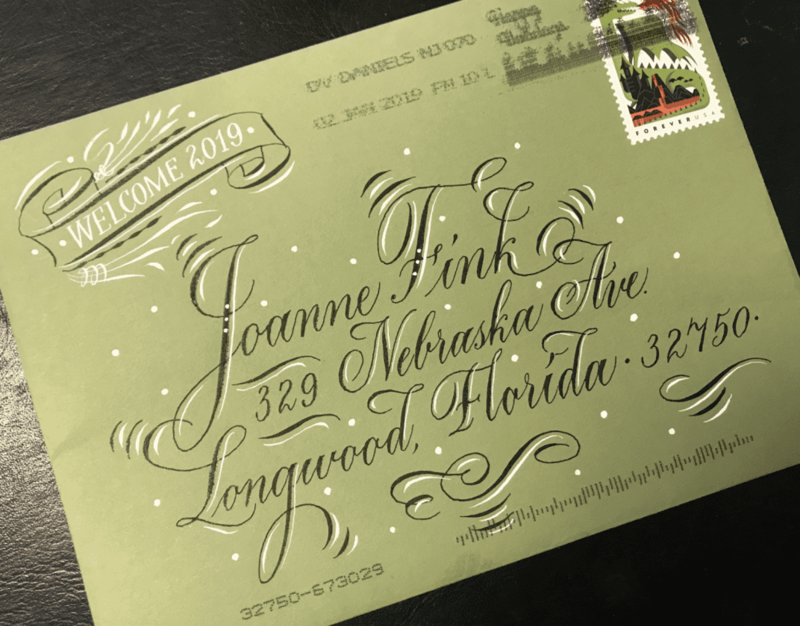 You don’t have to be a professional calligrapher to personalize a card or plaque–people love to see their name written out! Invite a group of friends over to share their creative gifts and help make cards. And please share what you do in our Facebook group— I look forward to seeing it. I hope you are doing well. Here’s a tip for your Bible journalling friends. I deliberately bought a journalling Bible in a LARGE PRINT edition because it has more art space than the normal print books. My Inspire Bible (Large Print) from Tyndale House Publishers is not only a beautifully crafted Bible but its large print edition also has wider margins, larger pages and larger coloring designs than the normal print edition. I love the extra space. Hope you do, too. When you Lose someone you love, quite by accident while browsing in a Hallmark store in NJ.